Noodling around the web yesterday to explore possible travel itineraries, I discovered a fine resource for understanding Spain’s wine regions and appellations. 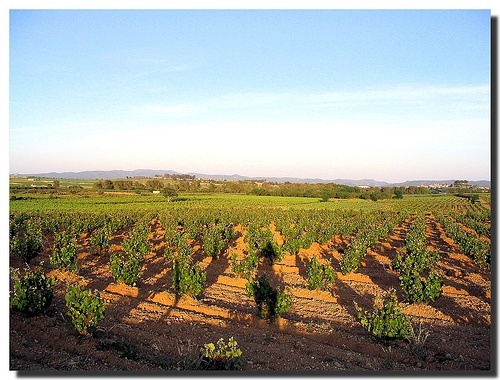 If you’re considering a self-guided trek through Spain and were wondering how to include some winery visits in your schedule, Spanish-wines.org gives pointers on specific wineries along with their addresses and contact telephone and fax numbers (although no email addresses, unfortunately; you’ll have to do some independent digging for that info). Tourism ideas aside, for wine lovers who want to understand what they’re drinking, the site is arguably most valuable for the explanations it gives of 14 wine-growing regions, from Andalusia to Valencia, and its A-to-Z listings of the myriad red and white grapes cultivated in Spain. Excellent trivia fodder in these listings, by the way: for instance, what’s the primary grape in Txakolí? The website, which bills itself as “The World of Spanish Wines,” has a few other gems, including a history of cava, but goes off topic with sections on the wines of Argentina and Chile. But, back to the reason I found the website, its attention to tourism-minded oenophiles. Its region-specific pages in the “Spanish Wines Tours” section offer overviews that can help in comparing wine routes along with winery details. One caveat: the website carries a 2011 copyright, suggesting that winery information is not up to the minute. The site’s sponsorship is not identified but may likely be a government- or producer-supported association.